Dry Needling – How can it help you? Posted by Impulse Chiropractic March 12, 2019 Comments Off on Dry Needling – How can it help you? Dry needling has become an increasingly popular aspect of treatment for many musculoskeletal conditions in recent years. Chiropractors, physiotherapists and other allied health clinicians are including this modality in the treatment of a wide number of musculoskeletal conditions. Dry needling involves needle penetration at specific anatomical sites, resulting in mechanical stimulation of the surrounding tissues and consequent physiological and psychological responses. Dry needling is a minimally invasive procedure in which a thin filiform needle is directly inserted into an active myofascial trigger point (MTrP), with the aim of eliciting a local twitch response in the muscle tissue. Myofascial trigger points (MTrP’s) are palpable and hyperirritable nodules located in the taut band of skeletal muscles. It is often referred to in laymen’s terms as a “knot”. These trigger points when active can cause intolerable pain, limit movement and functional capacity. Injury – muscles will typically tighten when in areas surrounding pain or injury to limit the severity of the damage. The exact physiological process underlying the effects of dry needling are still yet to be completely clarified. It has been suggested that dry needling may produce both local and central nervous responses to restore a physiological equilibrium at the site of MTrP’s. This ultimately results in reduced sensitisation to pain. Needle penetration destroys local tissue cells –> triggers a local inflammatory response –> stimulates release of inflammatory mediators (histamine and bradykinin) –> creates vasodilation (expansion of local blood vessels) –> brings along leukocytes (immune system cells that help protect the body against foreign substances and disease) –> removal of the needle causes tissue repair process. Afferent (sensory) signals from tissue damage as needle penetrates –> stimulates the release of enkaphalin (helps with the body’s pain regulation –> stimulates release of endorphins (help to give analgesic effect – pain relief) and serotonin from pituitary gland –> pain modulation and relief. WHAT CAN DRY NEEDLING HELP WITH? Dry needling when used in conjunction with other forms of manual therapy can help to relieve pain and movement limitations associated with myofascial trigger points. 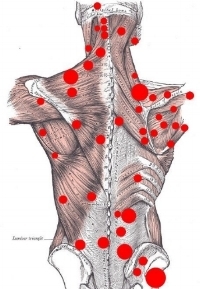 Trigger points can arise on there own or secondary to other issues such as nerve impingement, injury, illness etc. Dry needling can assist with pain management related to other musculoskeletal conditions such as sprains, strains and tendinopathies. We’re often asked what the difference between acupuncture and dry needling is. There are some similarities between the two. Both include the insertion of needles into the skin and underlying soft tissue. Both acupuncture and dry needling use the same type of needles. The major difference is related to the philosophy, theory and clinical reasoning of each treatment. Acupuncture originated from China over 5000 years ago. It is based on the belief that health is determined by a balanced flow, the vital life energy present in all living organisms. According to acupuncture theory, chi circulates in the body along twelve major pathways, called meridians, each linked to specific internal organs and organ systems. The insertion of the needles at these specific points along the meridians is thought to redirect the flow of energy to help with pain and other ailments. Dry needling is based off Western anatomical and neurophysiological principals. It should not be confused with the Traditional Chinese Medicine (TCM) technique of acupuncture. The application of needles in dry needling is typically based upon where the sites of pain and injury are. The aim of dry needling is to induce the physiological processes explained above to reduce pain and inflammation. There is no relationship or intention to influence “chi”. WHAT DOES DRY NEEDLING FEEL LIKE? Twitch response – a short local contraction of the muscle. This is a desired response as it tells the practitioner that the trigger point has been located. Needle phobia – Some patients have a genuine fear of needles and therefore should avoid this therapy. Patients are never forced to have this form of treatment. It is always presented as an option alongside other treatment methods. Thrombocytopenia – patients who have clinically low levels of platelets should avoid needling due to issues with clotting and bruising. It is safe to exercise after dry needling, however it is recommended that you give the body time to rest and recover so as to allow the treatment to take effect. At Impulse Chiropractic, our chiropractors are qualified and skilled in dry needling. Please feel free to discuss dry needling as part of your treatment options. At Impulse Chiropractic, our chiropractors are qualified and skilled in dry needling. Please feel free to discuss dry needling as part of your treatment options.